It was smiles all around for Westport last night at the Hotel & Catering Review Awards in Lyrath Estate, Co. Kilkenny. Hotel Westport was named a finalist in the Award for Ireland’s Family Friendly Hotel – having previously won this award in 2015, winner of the Outstanding Customer Service Award in 2014 and a finalist in the Family Friendly Award in 2016. 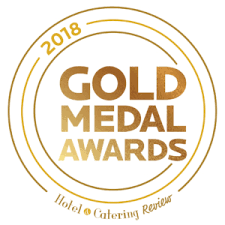 These prestigious awards celebrate the outstanding achievements of the hotel and catering sector and recognise and reward the high standards of excellence being delivered in the industry. The Gold Medal Awards Judging Panel spent 3 months traveling all corners of the country to visit every single property that entered the awards to validate and choose the winners. Hotel Westport prides itself on fantastic family rooms available at great value rates, indoor swimming pool and leisure facilities, Panda Kids Club (7 days a week), restaurants, bars and much more. With the Hughes family recently acquiring Westport House, Hotel Westport is the ideal staycation destination for a family break set right on the front lawn of Westport House. Guests enjoy exclusive train pick up/drop off as well as up to 25% off tickets and a Premium Pass to the Pirate Adventure Park. In attendance at the Awards ceremony were Eithne Cosgrove, Director of Sales & Marketing, and Colette Brawn, Assistant Manager, from Hotel Westport, who were delighted to represent on behalf of the owners, management and team at Hotel Westport. Hotel Westport was among ten finalists in the category for Ireland’s Family Friendly Hotel which included fellow Mayo properties, the Mulranny Park Hotel and Breaffy House Resort. Also represented at this prestigious event was Mayo’s only 5 Star Hotel Ashford Castle.